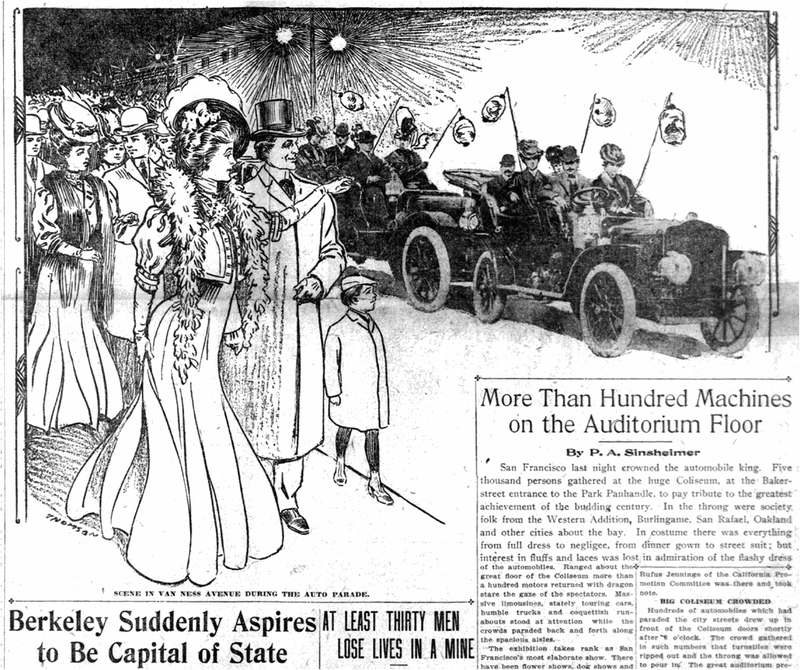 1907 was the year California fell in love with the automobile, and you can probably even pinpoint the exact moment: 7PM on February 18, when 254 automobiles began their parade down Van Ness avenue to promote the first San Francisco Automobile Show. "Sirens screeched, whistles resounded and the odor of gasoline was wafted over the city," the SF Call newspaper reported the next day. Led by a band playing "My Merry Oldsmobile," it was a fine parade - that is, until the drivers came in sight of the exhibition hall and went nuts. "When the Coliseum loomed into view the ten-mile an hour limit was forgotten and a general race followed, in which the band wagon was left in the rear." Nothing since the 1906 earthquake had shaken San Francisco more than that exhibition. Society swells turned out in furs and diamonds (yes, they dressed for an auto show) among the 5,000 that crowded the hall to see cars like the 40 horsepower Winton that "eats up the hills," and the Heine-Velox, "The Car With No Superfluous Parts and Everything Get-at-able." By 1907 San Francisco had one car for every 133 residents, far more than Chicago or New York City, and four times the national average per capita. Car culture in Santa Rosa and Sonoma County reflected the rest of the San Francisco Bay Area, judging by the 1907 newspapers. Auto brokers ran the first display ads of the latest models for sale, and someone buying a car was newsworthy only if it was an exotic model, such as Attorney Leppo's remarkable White Steamer (if you don't mind watching a short commercial, there's quite a good video by Jay Leno about this exact car). But horseless carriages were mostly in the papers because of the ever-increasing number of accidents and mostly fruitless efforts to curb speeding. Santa Rosa's speed limits in 1907 were 10 MPH on streets and 4 MPH when turning corners, but the laws were unenforceable; there were no radar guns in that era, and many (all?) cars even lacked speedometers. Unless someone was blatantly driving like a lunatic, all they could do was post speed limit signs and fine "chauffeurs" - still the name in 1907 for anyone behind a steering wheel - for other violations, such as not using lights after dark, or obviously racing. One speedster nabbed was Joe Sharp of Petaluma, who was taken to jail and fined $25, apparently more for insulting the arresting police officer than driving like the reckless drunk he was. Today the little Russian River village of Hilton is forgotten, and even its precise location is difficult to pin down. It was somewhere near the intersection of modern-day River Road (which follows the old train tracks) and Westside Road (which was the old River Road). Hilton doesn't appear in the 1897 atlas or 1900 county map, and the usually-reliable official post office latitude and longitude coordinates are wildly off mark for Hilton, placing it in the middle of a remote Petaluma hayfield. The new owners of the Hilton Park Campground at 10750 River Road believe the village was at their site. The community was named for Hilton Ridenhour whose family owned the large ranch that sprawled across both sides of the river at that location. The Hilton post office was created in 1894, and closed in 1953. Although autos were now a common sight on the roads, spooked horses remained problem. The year before, someone speeding on the road to Sebastopol caused a horse to bolt and dump a family out of its buggy. And a year before that, a local doctor's car hit a wagon carrying a family of five, the physician's lawyer unsuccessfully arguing that auto regulations were unfair. Now in 1907, a man threatened to sue another doctor because his auto caused the farmer's skittish horse to run away near the little village of Hilton. Despite the slow speeds of these old cars in normal operation, drivers chauffeurs seemed to be flung out of their vehicles with alarming regularity, such as Mrs. Craig, who tumbled to the street while rounding the corner of Fifth street and Mendocino. I couldn't understand why they had such trouble staying inside their cars until I read that Rose Wilder Lane said that her father, Almanzo, of "Little House on the Prairie" fame, never got the knack of driving a car, and even into the 1930s was sometimes thrown out when he tried to stop quickly. Like others from his generation, he retained the instincts of someone driving a buggy: If you want the horse to stop short, you pull back on the reins while bracing your feet hard against the floorboard. Unfortunately, steering wheels did not respond when yanked backwards, and jamming down with your feet would floor the accelerator and/or brake pedal. Shouting "whoa!" didn't help either, I'll wager. No review of old auto news would be complete without an update on the doings of local speed devil Fred J. Wiseman, who was involved in a terrible accident that year. While taking a young woman on a spin through Golden Gate park one Sunday afternoon, the steering gear fell off - not an unusual problem, back then - and the car tipped over, pinning the woman beneath. Confusion followed as to whether she was from Santa Rosa or a girl who lived in the earthquake refugee camp and known as the "Princess." Attorney James R. Leppo of this city is the proud possessor of one of the finest automobiles that has been brought to this city. It is a 1907 White Steamer costing $3000 and equipped with a twenty horse power steam engine, top, baggage rack on the back and in fact all the latest improvements and conveniences for comfort and travel...The machines are very fast, having made the trip from San Rafael to Petaluma last night in forty minutes. Dr. J. W. Jesse has purchased a handsome new automobile, a Dragon, and is justly proud of his car. It is the auto which was exhibited by the handlers at the San Francisco Automobile Show, and was the same machine which was voted the most popular car of the great show of autos. Dr. Jesse's car is a four cylinder of thirty horse power, and he will keep it principally for long distance calls, His present car is only eighteen horsepower and with the higher speed car the doctor will be able to get over the ground more rapidly than at present. It was a Dragon car which took up the duties of "pilot" for the endurance run to Lakeport Friday, after the Moon car, the official pilot, had broken down. The Dragon was also the second car to pass through this city in the run. The body of the car is blue and the upholstering is of black leather. The machine was secured through George C. Schelling. The skidding of an auto as it turned the corner of Fifth street and Mendocino avenue Thursday afternoon resulted in an injury to Mrs. Craig, who was running the machine. She was thrown out and severely bruised, and one ankle sprained. She was assisted to Dr. J. W. Jesse's office and her injuries treated, after which she again took the machine and drove off as unconcerned as if nothing had happened. The reckless driving of automobiles through the streets of Santa Rosa is to be stopped. Chief of Police Rushmore intends to ask the city council to cause signs to be placed at the various roads entering the city, calling attention to the fact that slow speed must be observed. While the warning is said to be for the information and guidance of out of town chauffeurs, a number of whom are known to exceed the speed limits permitted by the ordinance. Those in town are expected to obey the regulations. There have been a number of complaints as to the rate of speed maintained by chauffeurs in driving through the streets of Santa Rosa. This refers particularly to out of town chauffeurs. Chief of Police Fred Rushmore said Monday that it was his intention to ask the City Council for their sanction to have signboards warning chauffeurs that they must not exceed the speed limit provided in the city's ordinance. These signboards, which are directed by the State law, will be erected at the entrance to the city limits in each direction. The warning should induce the drivers of machines to come through town on "slow speed." Great Day for Autos--Sunday was a great day for autos. Scores of outside machines, each bearing a merry party, passed through town. "Alice Ferguson, a pretty 18 year old girl of Seventh and Harrison streets, who is known in the refugee camp in which she lives as 'Princess of the Camp" was the victim of an automobile accident yesterday afternoon in Golden Gate park. She was pinned under the body of the automobile in which she had been riding when a break in the steering gear caused the heavy machine to leave the road and turn completely over. It was at first believed that her skull had been fractured. It was found later that this was not the case and she recovered sufficiently to be taken to her home. "Miss Ferguson was riding into the city along the south drive in Golden Gate park when the accident occurred. She was in a car belonging to J. W. Leavitt and driven by F. J. Wiseman, a chauffeur. When Mrs. Catherine Ferguson received word of her daughter's mishap she was on the point of writing to Alice urging her not to ride in automobiles. Mrs. Ferguson supposed her daughter to be in Santa Rosa, where she has been visiting Wisemans mother for some weeks." A telephone message was received at the Press Democrat office on Monday from Mr. Wiseman in which he stated that the Call had made a serious mistake as regards the identity of the young lady. Mr. Wiseman stated that Miss Alice Ferguson, who was with him at the time of the accident, is the daughter of a well to do real estate man in San Francisco and is far from being the "princess of a refugee camp." There is a girl, Mr. Wiseman stated, by the same name who has the distinction of being the "princess." Mr. Wiseman stated that Miss Ferguson is quite well known here, and has visited Santa Rosa on several occasions, hence the desire to have the mistake corrected. The reports of the accident in the other morning papers did not dub Miss Ferguson as the "princess of the refugee camp." Officer Skaggs drifting along the dark streets Sunday night heard a loud "honk" in the distance. There was no illumination on the scene and such being contrary to the statutes made and provided, Skaggs bot [sic] "busy." When he had stopped the lampless auto he learned that it was driven by a prominent citizen of this municipality. The gentleman insisted that the lamp was out of order, but the officer with a match quickly had it aflame. The lampless run through the dark streets of Santa Rosa will cost the auto man five dollars. Recorder Bagley says that a second offense will cost the unlighted gas wagon man fifty golden dollars. ...[T]he State automobile law...is being violated by a number of chauffeurs and the police have received instructions to rigidly enforce it and also the law regarding the speed limit, which it was learned last night is ten miles an hour straight driving and four miles an hour when rounding corners. A number of warnings have been given, both as regards the speed limit and the lights and one complaint has already been filed and others will be if there is any further disobedience of the law. Several chauffeurs have run their machines with only one lamp lighted and one or two drivers of the chug chug machines have gone without any lamp displayed. They also exceed the speed limit. The law is going to be enforced here so chauffeurs had better govern themselves accordingly or suffer arrest and fine. Joe Sharp, a well known young man of Petaluma, attempted to make a race course out of Third street Monday afternoon. He was in playful mood and did not take kindly to the remonstrance of Police Officer John Boyes when that minion of the law requested a little less recklessness on the part of the driver. He used a lot of language that would be very rude coming from a Sunday school scholar, and told the officer in no uncertain tones what he thought of everything in general and people who wore the blue in particular. Sharp's language became such that Boyes finally decided to put him in the steel tanks to cool off, and the officer stood more foul language from Sharp than he was justified in taking. Because a man misbehaves, does not give him the privilege of abusing a police officer when he takes him into custody. When landed at the police station Sharp wanted to be released on bail, and he was thrown into the tanks to await the arrival of Police Judge Bagley. Sharp had declared his intention of resigning as a member of Officer Boyes' driving club because of the limit to the speed insisted on by the officer. Later in the afternoon Sharp was admitted to bail in the sum of twenty-five dollars. He had been drinking heavily. Dr. R. M. Bonar was held up by an irate farmer Saturday as he was returning from a professional visit to Hilton in his auto. Deputy County Clerk Ben F. Ballard was with him on the outgoing trip, and they noticed a man chasing a runaway horse. The farmer stopped Dr. Bonar on his return and demanded that he pay $15 damages for scaring the animal and causing it to run away. The physician refused to part with his good money and forced the man to let him pass, [and the farmer told the doctor] that he might take the number of the car and bring suit if he felt he could make out a case.